January saw the biggest solar storm since 2005, generating some of the most dazzling northern lights in recent memory. The source of that stormand others like itwas the sun's magnetic field, described by invisible field lines that protrude from and loop back into the burning ball of gas. Sometimes these field lines breaksnapping like a rubber band pulled too tightand join with other nearby lines, releasing energy that can then launch bursts of plasma known as sol ar flares. Huge chunks of plasma from the sun's surface can zip toward Earth and damage orbiting satellites or bump them off their paths. These chunks of plasma, called coronal mass ejections, can also snap Earth's magnetic field lines, causing charged particles to speed toward Earth's magnetic poles; this, in turn, sets off the shimmering light shows we know as the northern and southern lights. Even though the process of field lines breaking and merging with other linescalled magnetic reconnectionhas such significant effects, a detailed picture of what precisely is going on has long eluded scientists, says Paul Bellan, professor of applied physics in the Division of Engineering and Applied Science at the California Institute of Technology (Caltech). Now, using high-speed cameras to look at jets of plasma in the lab, Bellan and graduate student Auna Moser have discovered a surprising phenomenon that provides clues to just how magnetic reconnection occurs. They describe their results in a paper published in the February 16 issue of the journal Nature. "Trying to understand nature by using engineering techniques is indeed a hallmark of the Division of Engineering and Applied Science at Caltech," says Ares Rosakis, the Theodore von Kármán Professor of Aeronautics and professor of mechanical engineering and the chair of engineering and applied science. In the experiments, Moser fired jets of hydrogen, nitrogen, and argon plasmas at speeds of about 10 to 50 kilometers per second across a distance of more than 20 centimeters in a vacuum. Plasma is a gas so hot that atoms are stripped of their electrons. As a throughway for speeding electrons, the jets act like electrical wires. The experiment requires 200 million watts of power to produce jets that are a scorching 20,000 degrees Kelvin and carry a current of 100,000 amps. To study the jets, Moser used cameras that can take a snapshot in less than a microsecond, or one millionth of a second. As in all electrical currents, the flowing electrons in the plasma jet generate a magnetic field, which then exerts a force on the plasma. 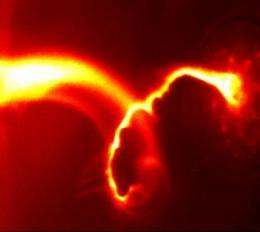 These electromagnetic interactions between the magnetic field and the plasma can cause the jet to writhe and form a rapidly expanding corkscrew. This behavior, called a kink instability, has been studied for nearly 60 years, Bellan says. But when Moser looked closely at this behavior in her experimental plasma jets, she saw something entirely unexpected. She found thatmore often than notthe corkscrew shape that developed in her jets grew exponentially and extremely fast. The jets in the experiment formed 20-centimeter-long coils in just 20 to 25 microseconds. She also noticed tiny ripples that began appearing on the inner edge of the coil just before the jet brokethe moment when there was a magnetic reconnection. In the beginning, Moser and Bellan say, they did not know what they were seeingthey just knew it was strange. "I thought it was a measurement error," Bellan says. "But it was way too reproducible. We were seeing it day in and day out. At first, I thought we would never figure it out." But after months of additional experiments, they determined that the kink instability actually spawns a completely different kind of phenomenon, called a Rayleigh-Taylor instability. A Rayleigh-Taylor instability happens when a heavy fluid that sits on top of a light fluid tries to trade places with the light fluid. Ripples form and grow at the interface between the two, allowing the fluids to swap places. What Moser and Bellan realized is that the kink instability creates conditions that give rise to a Rayleigh-Taylor instability. 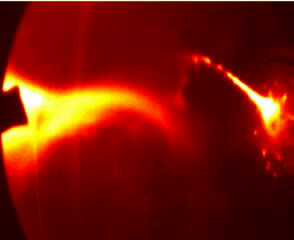 As the coiled plasma expandsdue to the kink instabilityit accelerates outward. Just like a passenger being pushed back into the seat of an accelerating car, the accelerated plasma is pushed down on the vacuum behind it. The plasma tries to swap places with the trailing vacuum by forming ripples that then expandjust like when gravity forces a heavy fluid to try to change places with a light fluid underneath. The Rayleigh-Taylor instabilityas revealed by the ripples on the trailing side of the accelerating plasmagrows in about a microsecond. "People have not observed anything like this before," Bellan says. Although the Rayleigh-Taylor instability has been studied for more than 100 years, no one had considered the possibility that it could be caused by a kink instability, Bellan says. The two types of instabilities are so different that to see them so closely coupled was a shock. "Nobody ever thought there was a connection," he says. What is notable is that the two instabilities occur at very different scales, the researchers say. While the coil created by the kink instability spans about 20 centimeters, the Rayleigh-Taylor instability is much smaller, making ripples just two centimeters long. Still, those smaller ripples rapidly erode the jet, forcing the electrons to flow faster and faster through a narrowing channel. "You're basically choking it off," Bellan explains. Soon, the jet breaks, causing a magnetic reconnection. Magnetic reconnection on the sun often involves phenomena that span scales from a million meters to just a few meters. At the larger scales, the physics is relatively simple and straightforward. But at the smaller scales, the physics becomes more subtle and complexand it is in this regime that magnetic reconnection takes place. Magnetic reconnection is also a key issue in developing thermonuclear fusion as a future energy source using plasmas in the laboratory. One of the key advances in this study, the researchers say, is being able to relate phenomena at large scales, such as the kink instability, to those at small scales, such as the Rayleigh-Taylor instability. The researchers note that, although kink and Rayleigh-Taylor instabilities may not drive magnetic reconnection in all cases, this mechanism is a plausible explanation for at least some scenarios in nature and the lab. More information: "Magnetic reconnection from a multiscale instability cascade." Nature, 2012. A 3-D way to release magnetic energy... fast! very cool. its unfortunate that the eu people will soon be here to muck it up with their wild assertions that astrophysicists do not look at plasma at all and ignore it and its effects. "Sometimes these field lines breaksnapping like a rubber band pulled too tightand join with other nearby lines, releasing energy that can then launch bursts of plasma known as solar flares." These lines dont really exist. The field is continuous. If the magnetic field is changing that most likely reflects a change in the movement of electrons. The is no "snapping" of the magnetic field. There are sudden changes in direction of the current in the flux tube, which leads the sudden changes in the external magnetic field. I believe he means the "electric universe" crowd. brant is right. But I think the idea of 'snapping' from one field line to the next isn't as bad as it sounds. The field is continuous but not homogeneous. 'Snapping' occurs when the ion stream suddenly shifts from one potential trough into another that is close by at some point but then diverges due to the topology of the field. One could imagine that the field lines represent these 'preferred' (least energy) lanes. In that sense we do have a snapping along field lines and a sudden spike in magnetic field differential due to the sudden change in ion transport direction. oh my ghod, 20,000 kelvin! I've always wondered, is there a maximum limit when it comes to temperature? I know that absolute kelvin is the lower limit, but has anyone ever read anything on a maximum temperature limit? @panorama - Isaac Asimov wrote a story on that a few decades ago. oh my ghod, 20,000 kelvin! I've always wondered, is there a maximum limit when it comes to temperature? its unfortunate that the eu people will soon be here to muck it up with their wild assertions that astrophysicists do not look at plasma at all and ignore it and its effects. Would it be "mucking it up" to point out that statements like the following quote from the article are utterly false and complete nonsense? This is about as untrue as these types of articles get. If worded properly, i.e. focusing on changing field topology and not imaginary magnetic field lines, there would still be room for honest debate. But "magnetic field lines" do not exist in extant reality - they are mere descriptive conventions. They aren't real things in and of themselves. I think your statement of "...do not look at plasma at all and ignore it and its effects" is an intentionally deceptive straw-man argument. Contrary to the recent ignominious slander of Leonardo that he was not really a scientist, as a student of Luca Pacioli and Nicholas of Cusa he pushed the boundaries of many areas of research. Among these were his visually beautiful studies of vortical filament flows. Therefore the just announced breakthrough that plasma corkscrew kink instabilities engender Rayleigh-Taylor instabilities that then result in the phenomena of reconnection that we see in solar flares is part of Leonardo's legacy. Thus, we must joyously commend Auna Moser and Paul Bellan for continuing in his footsteps. "The field is continuous but not homogeneous. 'Snapping' occurs when the ion stream suddenly shifts from one potential trough into another that is close by at some point but then diverges due to the topology of the field. One could imagine that the field lines represent these 'preferred' (least energy) lanes. In that sense we do have a snapping along field lines and a sudden spike in magnetic field differential due to the sudden change in ion transport direction." Yeah, that phenomena is called an exploding double layer. Calling it magnetic reconnection is an insult to the readers intelligence.